Singapore’s domestic loans rose 5.7% YoY in April. This is a mild acceleration from the 1Q18 growth of 4.8%. Loans growth in Hong Kong continues to be robust. Loans expanded 17.1% YoY in April. Singapore’s domestic loans in April grew 5.7% YoY. Loans growth in April was driven by business loans that expanded 6.1%. Consumer loans growth in April was 5.1% YoY, sustaining the strong momentum we saw since in November. Mortgage loans maintained its steady pace of growth at 4.7% YoY. Car loans growth spiked to 5-year highs with a rise of 7.8% YoY in April. Hong Kong’s loans in April grew 17.1% YoY – fastest in 6 months. Loans growth was supported by HKD loans growth of 25% YoY, boosted by IPO financing. Excluding IPO, HKD loans rose 19%. Hong Kong’s residential volume and value showed renewed vigour after some weakness in January. 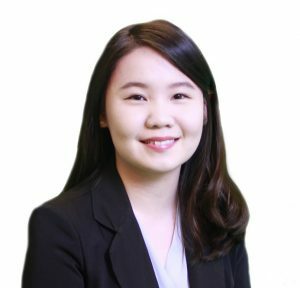 According to JLL Hong Kong, May residential sales volume was up 55.9% MoM and value was up 59.3% MoM, driven by demand from first-time homebuyers and the ability of developers to drive up prices in the secondary market where supply is limited. 3-month SIBOR crept up in May to near 10-year highs. We expect the Singapore banks’ NIMs to be on a gradual upward trend given expectations of 3 or more Fed rate hikes in 2018. NIM expansion will be the main share price catalyst for the next few quarters. Despite the 40bps increase in SIBOR this year, mortgage loans growth has remained resilient at 4.4% YoY. Therefore, we do not expect new mortgage loans to be adversely affected by the gradual increase in SIBOR. Global jack up utilisation rate has bottomed out in February and now hovering around c.60%. However, global day rates have been on a downward trend and short-term recovery is unlikely because utilization rates have not reached high enough levels for offshore contractors to enjoy much pricing power. Oil prices rose but charter fees stayed flat even though the volume of business increased. The industry is burdened by structural overcapacity and is unlikely to see a recovery in profitability in the short term. Maintain Singapore Banking Sector at Accumulate. Loans growth remains healthy. Banks are guiding for high single-digit loans growth in 2018. The vibrant loans growth in Hong Kong should help banks meet this target. The continuing rise in SIBOR and SOR will keep NIMs elevated. Volatility in the capital market may place some downward pressure on wealth management business. Banks are benefiting from both expanding loan volume and margins this year. Singapore domestic business loans growth strengthening in April. 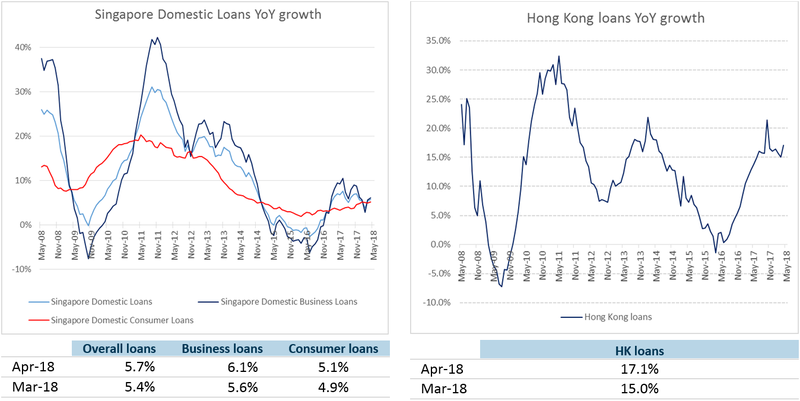 Hong Kong loans grew 17.1% YoY in April. 3M SIBOR reached its highest level in almost 10-years and 3M SOR reached its highest in 2-years. Bank savings deposit rates are stagnant. 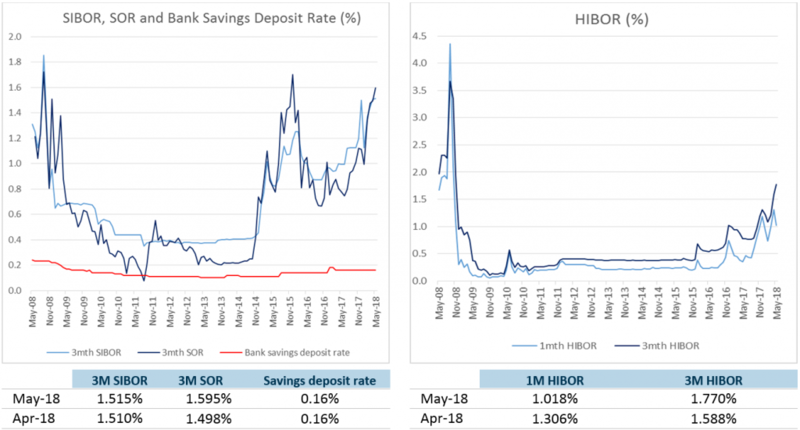 As HIBOR increases, DBS’ and OCBC’s funding costs will increase but it is counterbalanced with higher interest rates charged on loans.